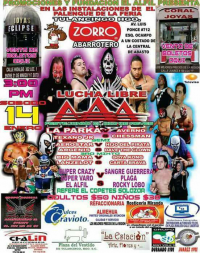 Local rudos cheated to win. 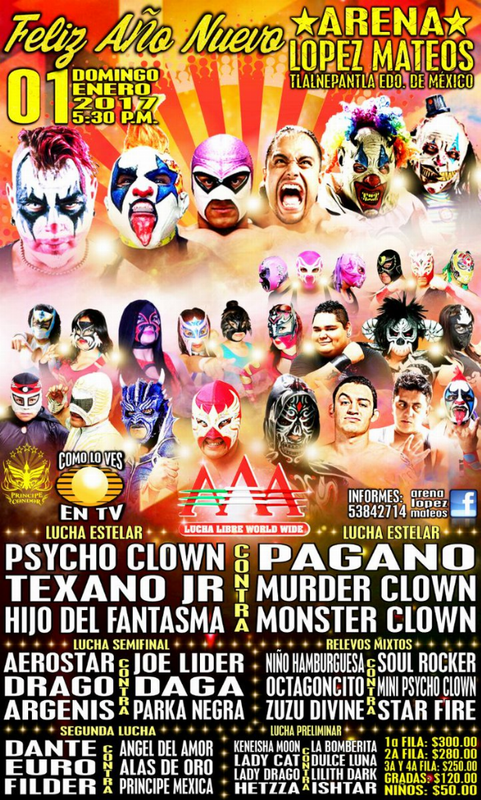 Monster & Murder interfered to keep Lider in, while Psycho Clown helped Texano to escape. Pagano & Lider were the last two in, and they did the one fall bit at the end like a CMLL match - only those two did an extreme style match. 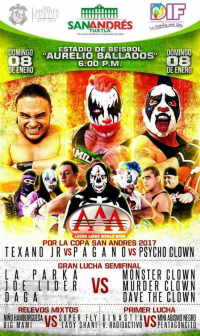 Pagano beat Lider, who lost his hair. 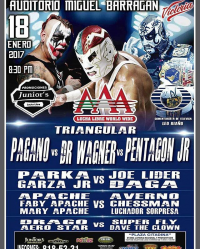 2) Aerostar & El Mexicano vs Hijo de Pirata Morgan & Máscara Año 2000 Jr.
Joe Lider got his head shaved during the last week (probably early on, because it was growing back well.) 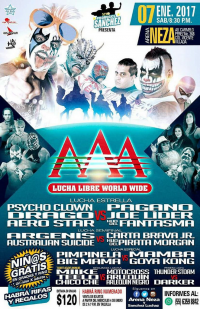 Aerostar was hurt and left the match earlier. Goya distracted Psycho Clown setting up a Pagano foul. 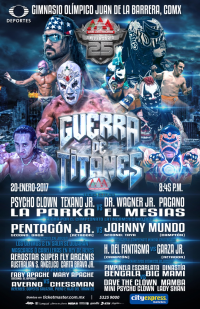 replaced Viento defending his title against Gran Sumerio. 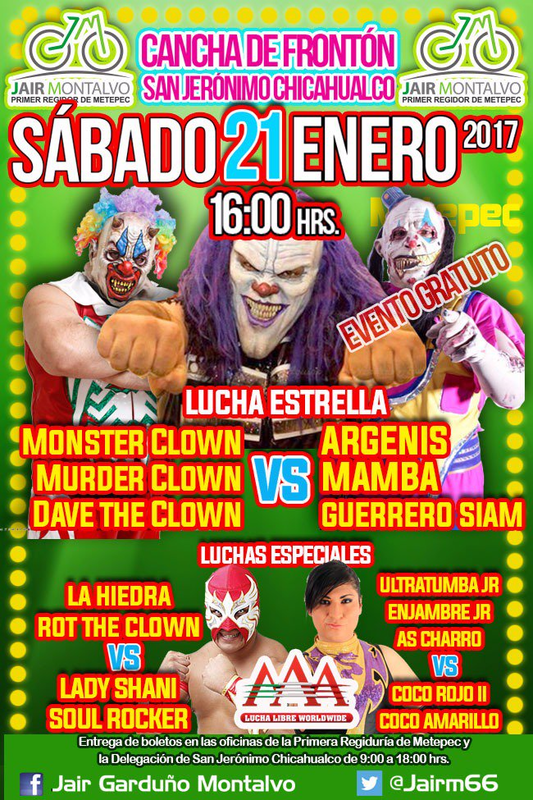 Viento was injured and the match was canceled, though Sumerio still attacked and unmasked him. 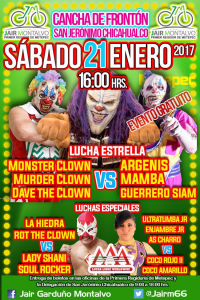 3) Drago & El Mariachi b Carta Brava Jr. & Máscara Año 2000 Jr.
Niño Hamburguesa, Venum, and Soul Rocker all missed the show, with Drago and El Mariachi (??) 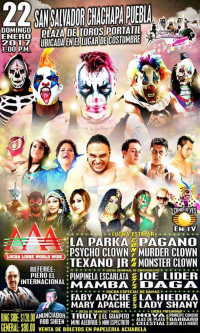 in as replacements. 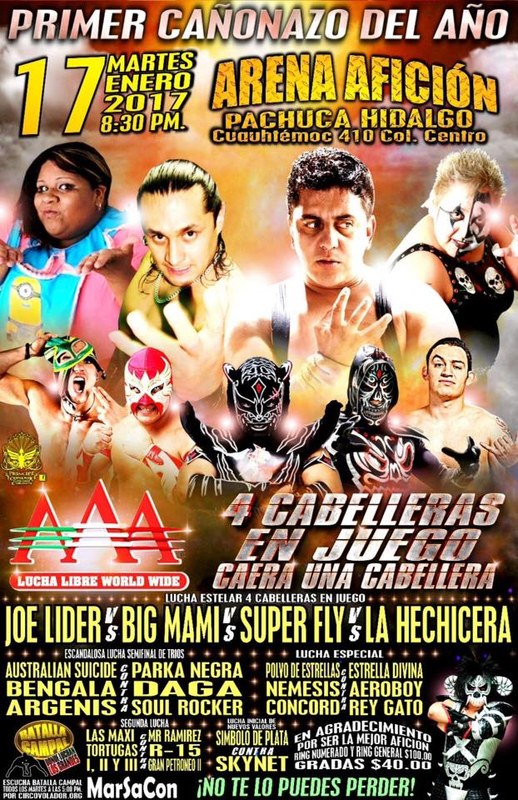 Bengala replaces El Apache, Joe Lider replaced Ricky Marvin. 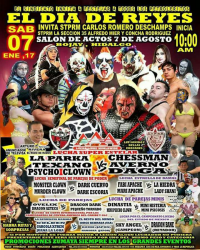 sets up Concord & Nemesis getting a tag title shot against Rey Gato & Aeroboy. 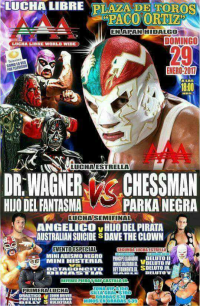 0) Bogar, Danny Boy, Efecto b Mini Lama, Steel Ángel, Vagabundo Jr.
Hijo del Pirata Morgan was the suprise luchador, and Elegido replaced Apache. 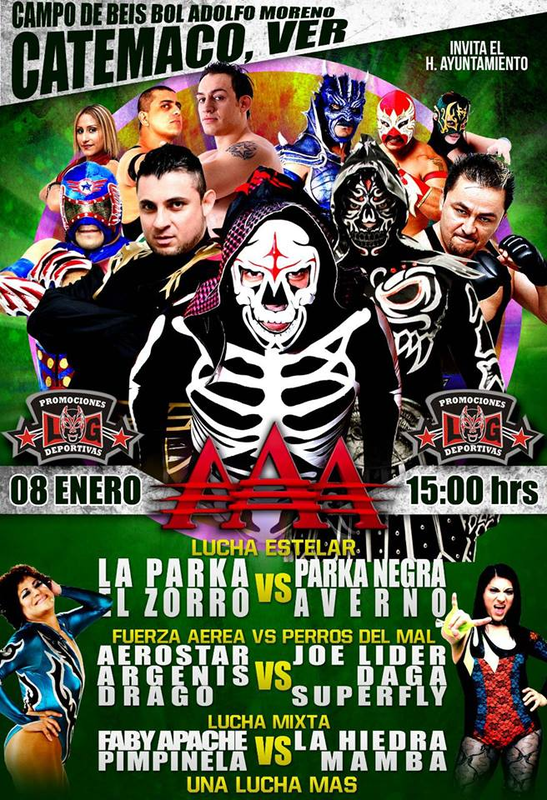 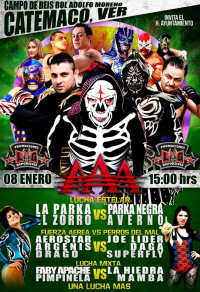 3) Daga & Joe Lider b Garza Jr. & La Parka Jr.
Ayako Hamada was with the Perros del Mal. 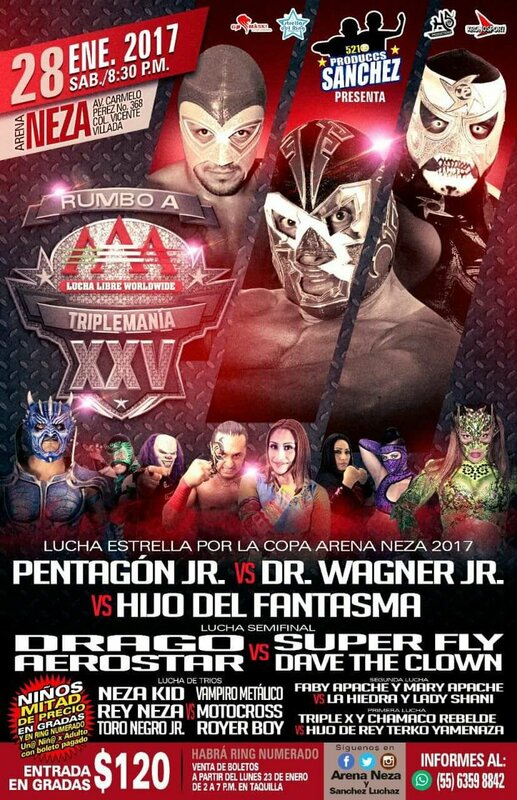 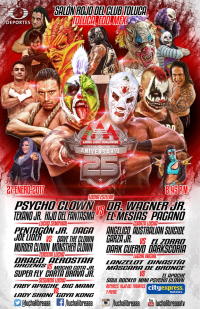 4) Pentagón Jr. DQ Pagano, Dr. Wagner Jr.
4) Emperador Azteca, Último Gladiador, Zumbi DCOR Herejía, Hijo de Máscara Año 2000, Universo 2000 Jr.
Pagano fouled Psycho, Parka fouled Pagano and got the pin. 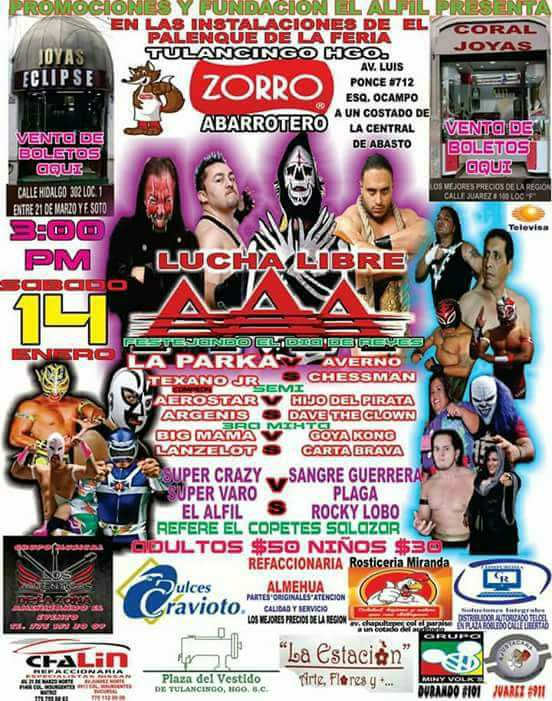 Apolo Estrada (in his Ephesto shirt) and Neza Kid added to the match. 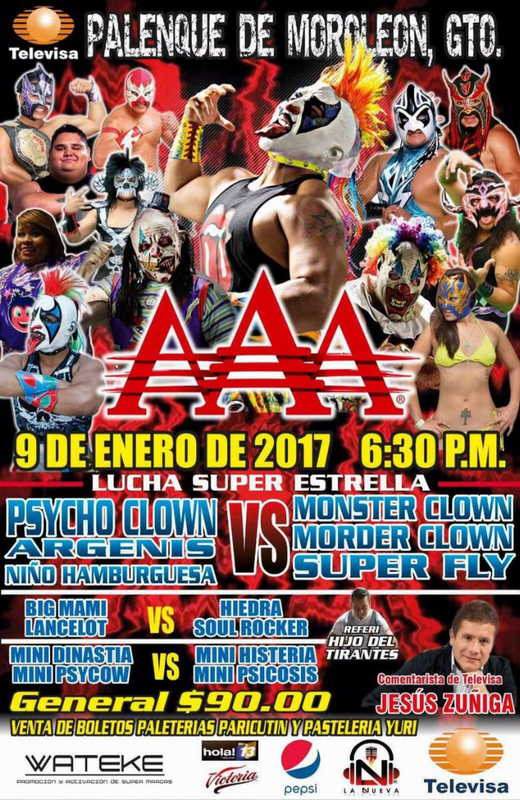 Super FLy pulled Aerostar's mask. 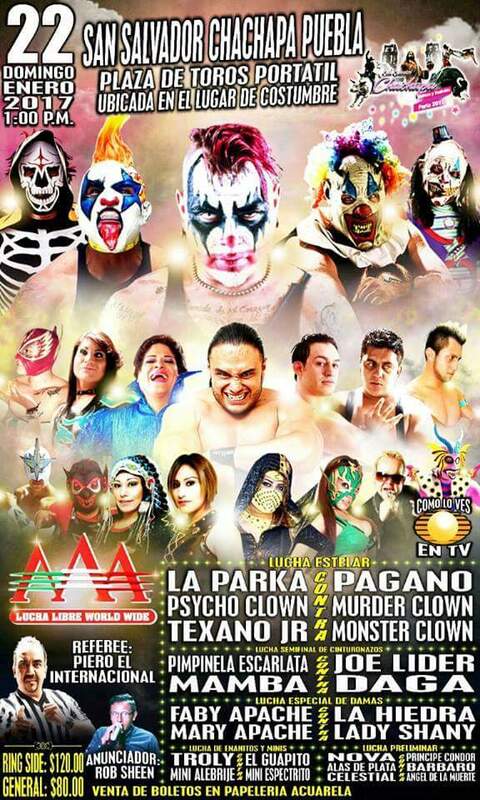 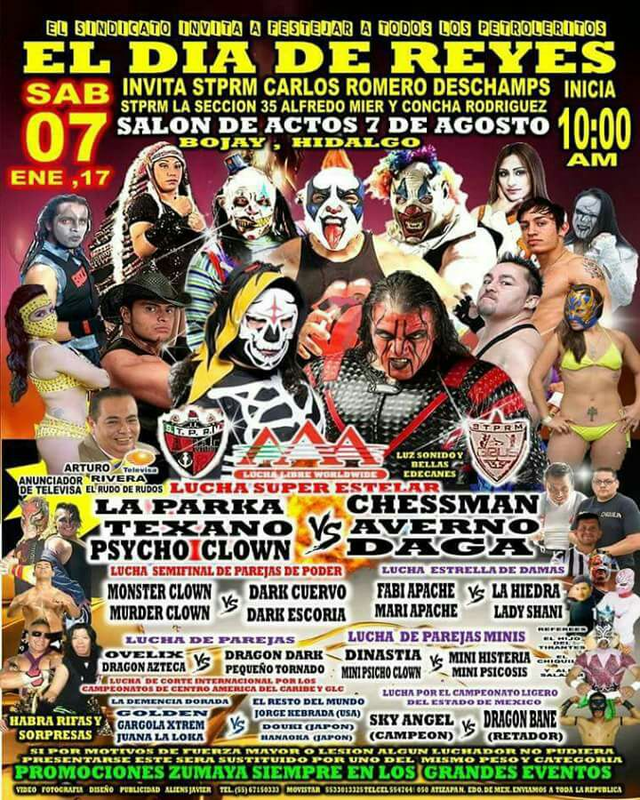 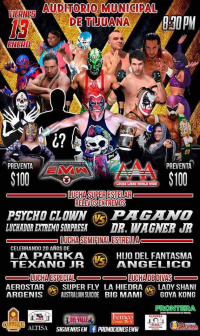 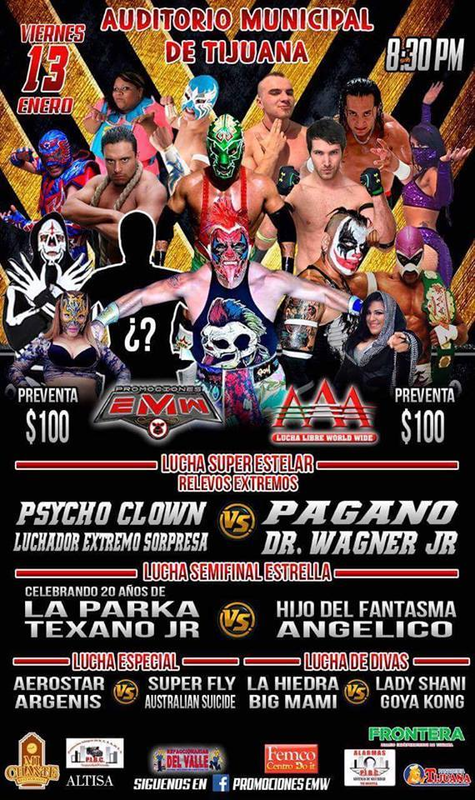 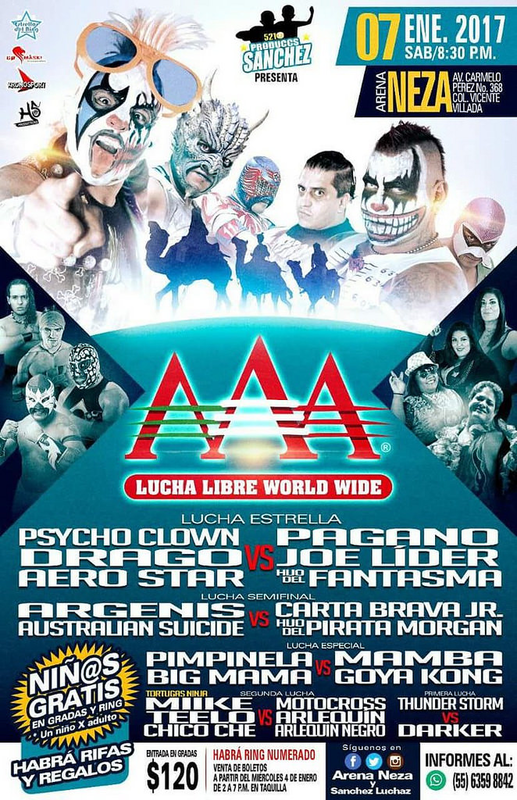 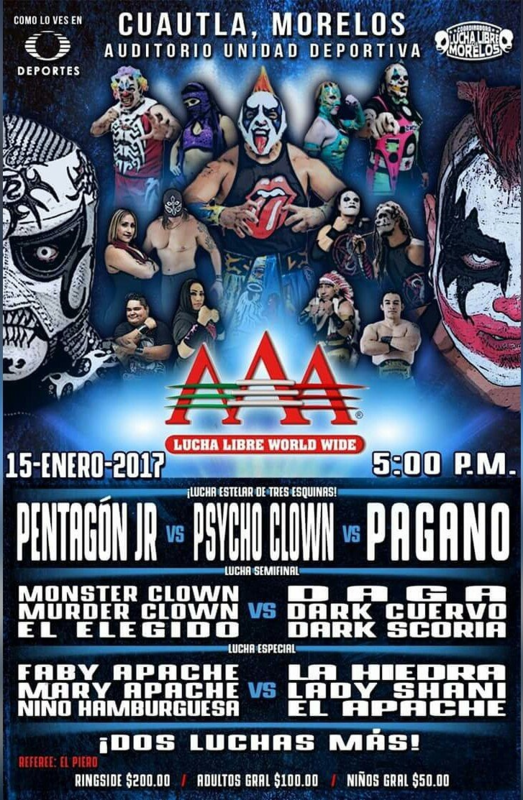 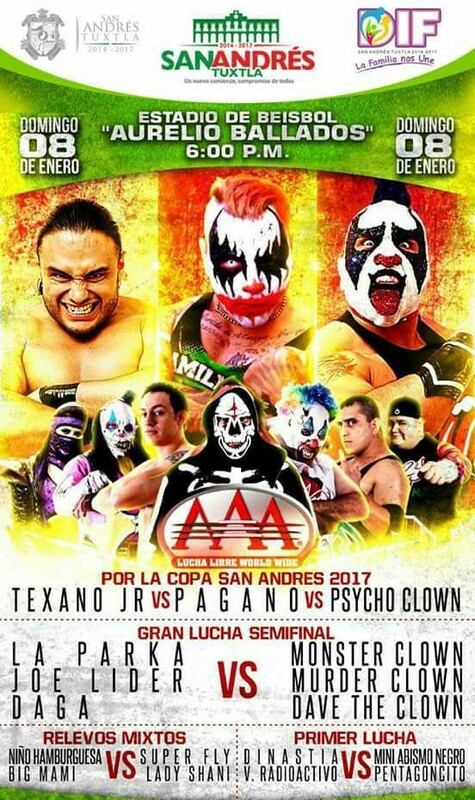 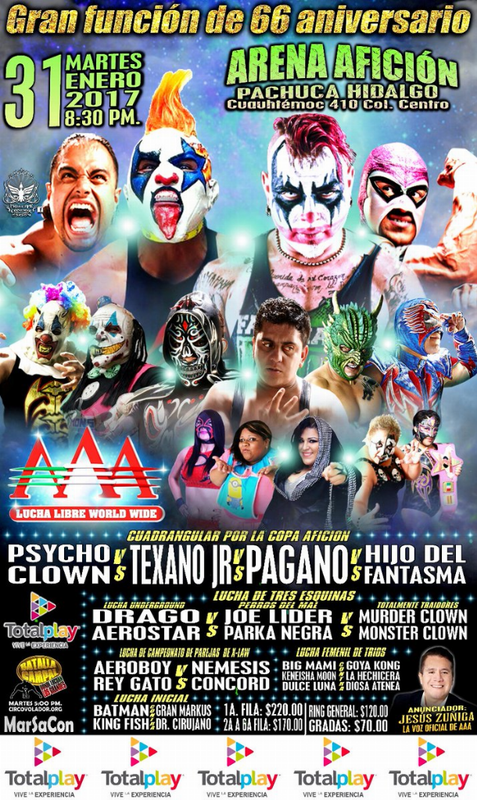 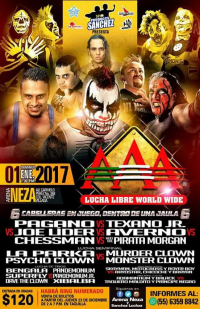 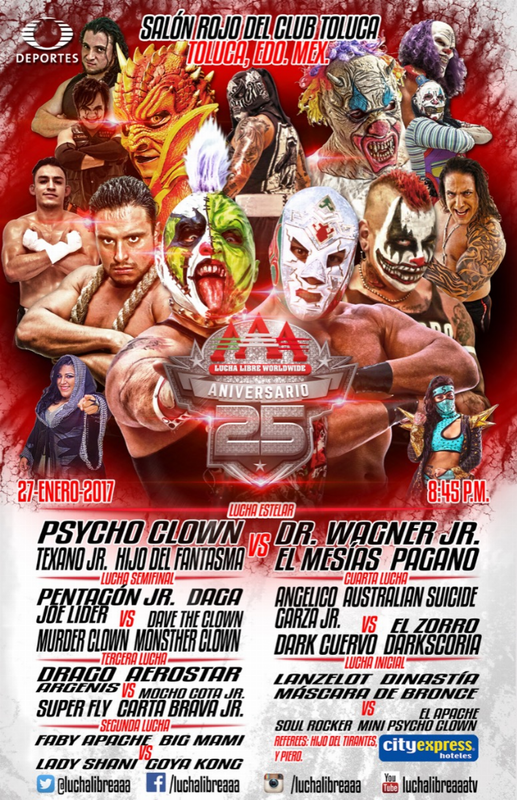 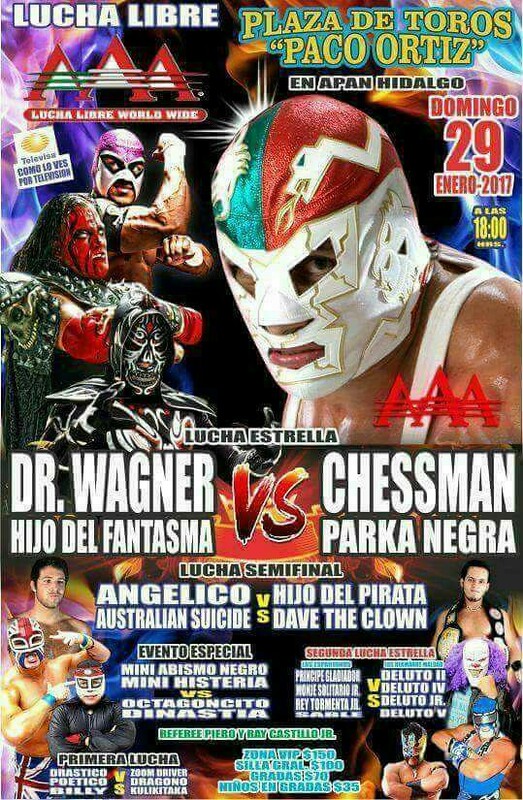 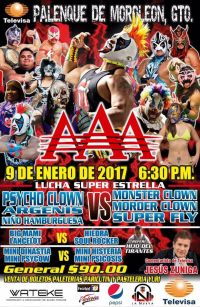 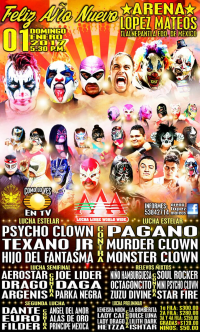 Psycho Clown replaced Pentagon Jr. on 01/23. 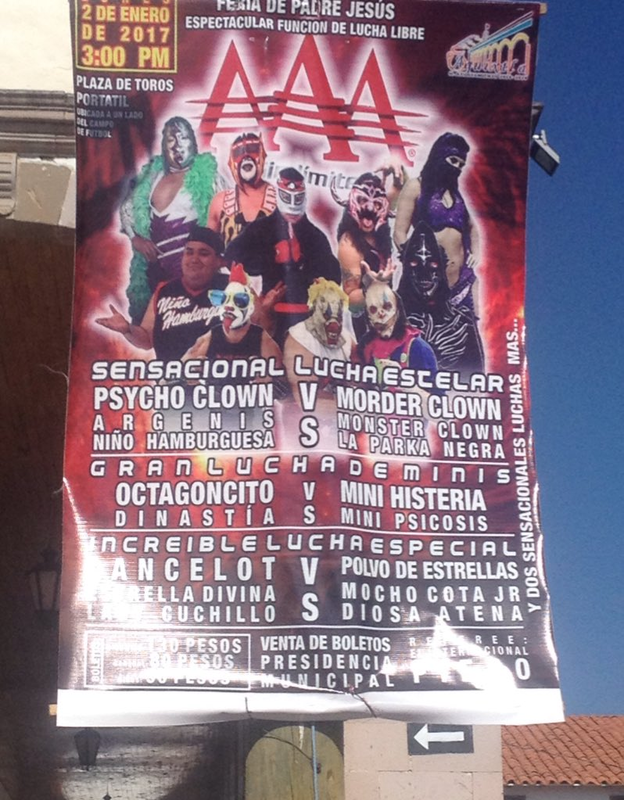 Fantasma won when the other two brawled outside for 20. 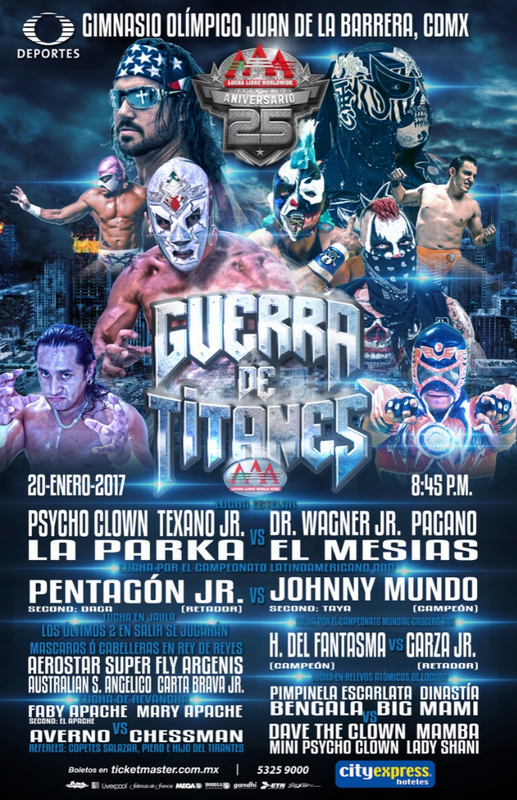 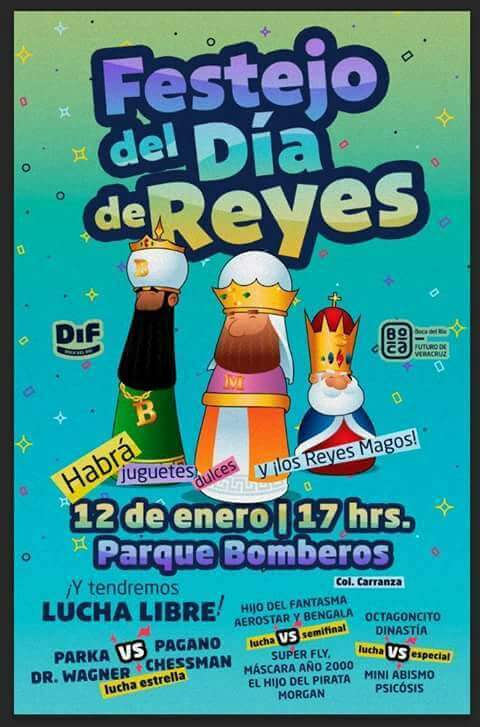 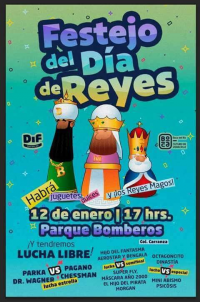 1) Áspid, Roco Vann, Roco Vann Jr. b Amenaza Nocturna, De Luto II Jr., The Black Jr.
3) De Luto II, De Luto III, Deluto IV, Deluto Jr. b Guerrero De Ultratumba, Monje Solitario Jr., Príncipe Gladiador, Rey Tormenta Jr.
Keneisha Moon announced she was retiring after the match. 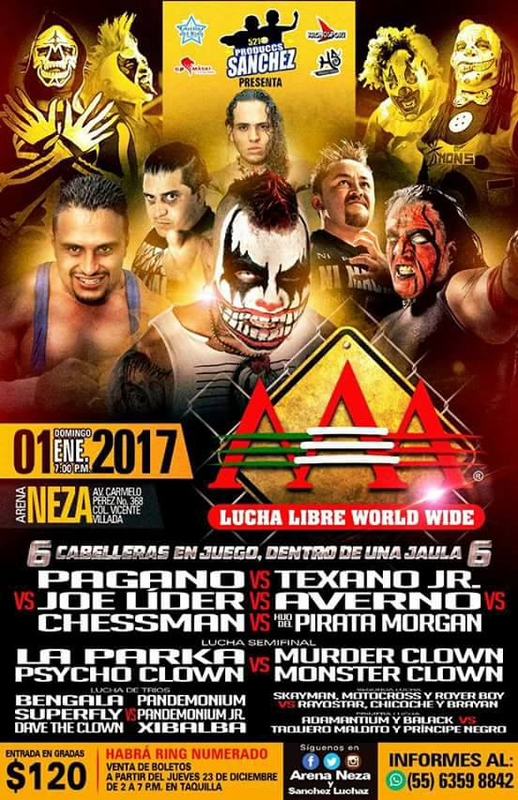 Texano replaced Pentagon Jr. on 01/25.